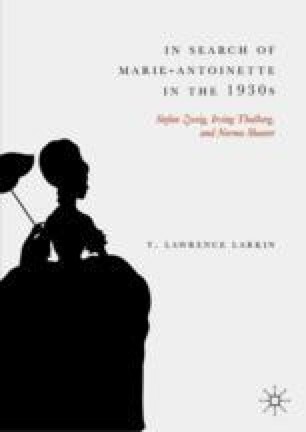 This chapter declares the core subject of the book to be an inquiry into the respective contributions of Stefan Zweig, Irving Thalberg, and Norma Shearer in formulating what each believed to be an “authentic” image of “Marie-Antoinette” for public consumption during the 1930s. Zweig wrote a best-selling biography in Salzburg, Thalberg then acquired film rights to the book and oversaw the development of a screenplay in Culver City, and Shearer worked closely with a new producer to alter the screenplay and to perform the title character. Writings on the myth of “Marie-Antoinette,” the use of “objectivity” in historical writing and “authenticity” in historical film, and the three creative agents are explained and assessed as a prelude to putting forth three chapters adhering to a nine-point argumentative model that balances the three professionals’ research standards and strategic objectives in the formulation of a new myth at once sensitive to the historical record and suitable for public consumption.